Refrigerator Repair vs. Replacement – Which Should You Choose? 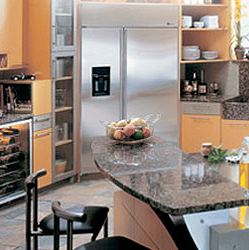 One of the factors you need to look into refrigerator issues is the cost of New York refrigerator repair. For instance, if the cost of repair is cheaper than the price of a new appliance, you should consider getting your refrigerator fixed. Your fridge is an integral part of your house and kitchen as it keeps the food fresh. However, even the most sophisticated units can break down. Here are some important factors to consider when making a decision. Type – Refrigerators with a built-in ice maker are much more likely to need repairs compared to bottom or top-freezer models that don’t have an ice maker. Bottom-freezers should be fixed 7 years after purchase. After this period, you should consider buying a new one. Built-in refrigerators are usually more affordable to fix. If there’s a significant damage, you should call a repair technician to fix the problem. Side-by-side refrigerators should be fixed within 5 years after purchase. Consider replacing the unit after this period. Energy efficiency – If your refrigerator is an older model, you should consider replacing it with an energy-efficient unit. Purchasing a new refrigerator before your old one breaks down can help you save a lot of money, time and stress. Age – The usual lifespan of refrigerators is 11 to 15 years. Some units can last 20 years. The number depends on the usage, maintenance, and brand. The older your refrigerator gets, the more costly the repairs will be. If the refrigerator is already between 8 and 15 years, you should compare the cost of repairs with the price of a new unit. Consider replacing a refrigerator that is more than 15 years old. Signs of Refrigerator Repair If your foods are going off earlier than their expiration dates, you should get your refrigerator checked as well. Another sign of refrigerator repair New York City is leaked. If you see a puddle of water at the bottom of the refrigerator, there is something wrong. Make sure that nothing in the refrigerator has caused the liquid to puddle. Check if some open containers or bottles have spilled. If you cannot determine the source of leak, you should call a repair technician immediately to get your appliance checked. If your refrigerator is making a strange noise, you should call an expert in New York appliance repair. Refrigerators can be noisy when they’re cycling on and off. After using your appliance for some time, you should be able to determine whether your refrigerator is making a strange noise. Call a repair technician if you hear snapping, clanking or hissing sounds from the refrigerator. If your refrigerator is new and has a service plan or warranty, you should consider getting your appliance checked by a refrigerator technician. Get a written estimate from an appliance repair company to compare the cost of repairing and buying a new one. If the appliance is old or has several broken parts, it will be better to replace it. This entry was posted in Refrigerator repair and tagged new york appliance repair, new york refrigerator repair, refrigerator repair new york city. Bookmark the permalink.